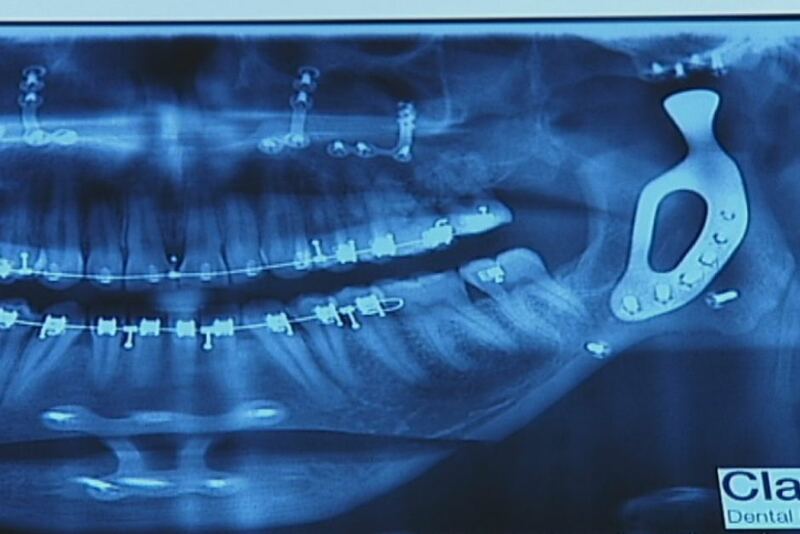 Surgeons have successfully implanted a titanium 3D-printed prosthetic jaw in a Melbourne man in an Australian-first operation. It is hoped the success of the locally designed and tested part will lead to high-tech export opportunities. The patient, 32-year-old psychologist Richard Stratton, was missing part of his jawbone including the left condyle, the joint to the skull. 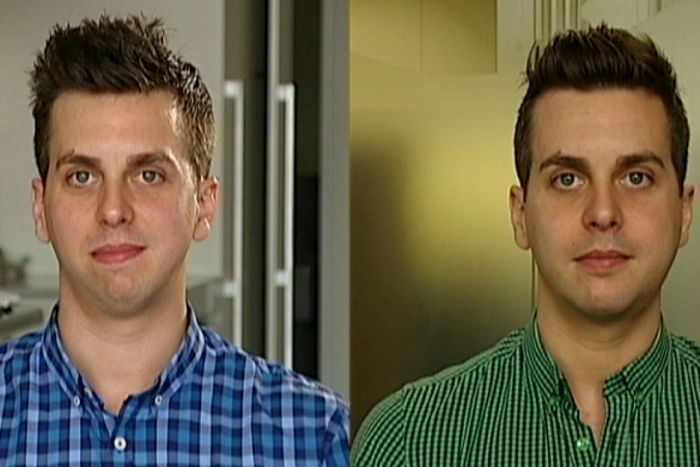 He believed part of his jaw never grew properly after he received a bad knock to the jaw during childhood. In the past few years, he has suffered increasing pain while chewing or moving his jaw and he has not been able to fully open his mouth. Oral and maxillofacial surgeon Dr George Dimitroulis designed a prototype prosthesis that was refined and tested by experts at Melbourne University’s mechanical engineering department. 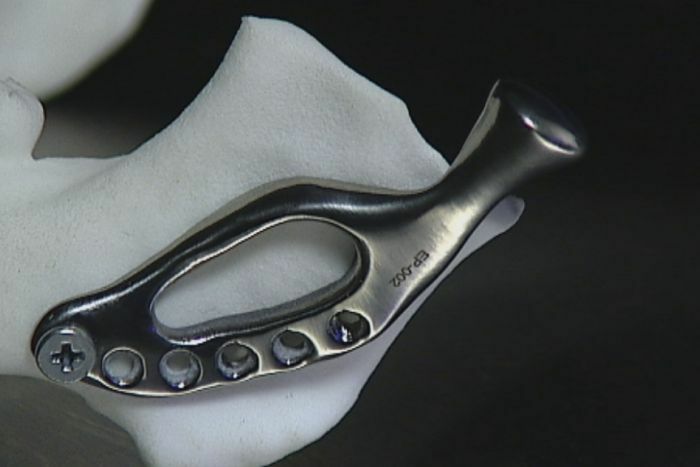 Dr Dimitroulis said that while there had been a handful of 3D-printed jaw operations worldwide, he was not aware of any that incorporated a titanium part and a 3D-printed plastic jaw joint. “In terms of joint replacement specifically, what we call the TMJ – the temporomandibular joint – we suspect that this may be the first 3D-printed jaw joint in the world,” he said. It was designed to protect the skull from a rubbing metal joint which would wear and erode into the cranial cavity. “The beauty of this particular joint itself is that it was designed in Australia and manufactured [by an Australian firm] … and not just manufactured in the common sense, but 3D printed,” he said. 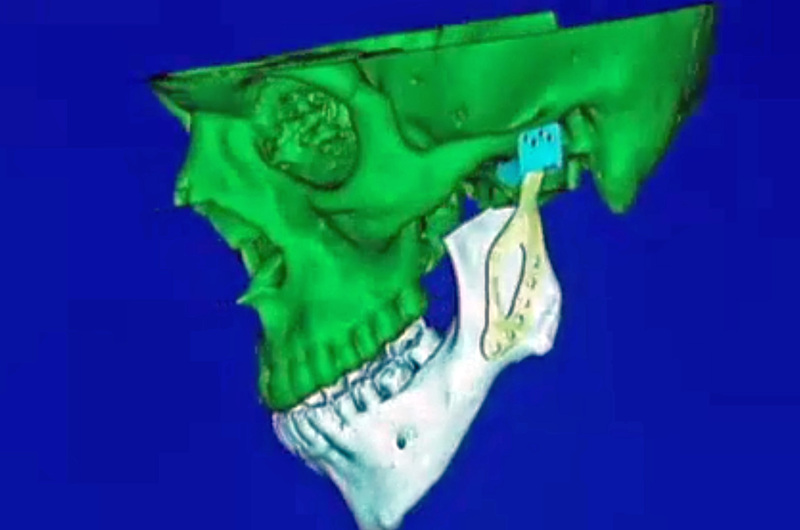 Dr Dimitroulis said it was a great example of “smart Australia” and 3D printing would lead to “revolutionary” changes in jaw prosthesis surgery. Before the operation, Mr Stratton said he was excited to be “patient X on the Australian joint” and joked that he had put in an order for a “Brad Pitt” jaw. He hoped many more patients would benefit from having their replacement joints 3D printed and personalised to them. “It sounds a bit [like] science fiction … I don’t really understand 3D printing that much but it’s exciting,” he said. “They have a 3D model of my skull and the fact that they’ve made the joint to fit that perfectly, I feel a lot safer in knowing that it’s not just a factory made, off-the-shelf joint. Port Melbourne firm 3D Medical used powdered titanium that was heated and fused one layer at a time to print the prosthesis. Technicians also used CT scan images to print a 3D plastic model of Mr Stratton’s skull and then refined the titanium part to provide a perfect fit. While this part was manufactured in New Zealand, future parts will be locally produced. Company chairman Dr Nigel Finch said about 30 versions of the part had to be printed during the customisation process but he predicted that any future adaptation would take much less time. “It really is the sunrise of a whole new industry,” he said. “I think that greater support, better understanding by the regulators and better understanding by hospitals and the healthcare system, will see the adoption of 3D medical implants and other technologies starting to become mainstream. Dr Finch said the cost of the technology had come down to a “truly competitive” price point compared with conventional manufacturing of parts. The use of highly-automated machines also eliminated much of the labour cost that had traditionally made Australian manufacturing uncompetitive. “One of the things that’s really personally exciting for me is this whole idea about bringing a manufacturing base back to Australia and focusing around the digital aspect of it,” Dr Finch said. Melbourne University biomedical engineer, Dr David Ackland, said it was “quite unusual and unexpected” to be approached by an oral and maxillofacial surgeon with a design prototype as computer simulations had mostly been performed on knee, shoulder and hip joints in the past. “It’s very very important before you put an implant into the human body that you know that it’s going to be able to withstand the normal forces, the internal forces in the human body,” he said. “We performed computer simulations [on the jaw prosthesis] to determine the joint loading and the loading on the implant and the screws, which of course the prosthesis would be subject to during biting and chewing. Dr Ackland said 3D printing technology was still in its infancy so there were not a lot of customised components being developed or placed inside the human body. “It’s incredibly exciting and there’s enormous potential for use of 3D printing technology to develop customised, patient-specific joint replacements and prosthetic components for a range of patients with different musculoskeletal disorders,” he said. Just after completing the five-hour operation, Dr Dimitroulis said he was “very proud” that three years of hard work had paid off. “The excitement was unbearable I think, just at the last minute we thought it just wasn’t going to fit in but it just slid in nicely,” he said. Dr Dimitroulis said patients with severe osteoarthritis of the jaw would benefit from the new implant and two patients had already signed on to receive one. Mr Stratton said he found the pain and swelling confronting in the first few days after surgery but one month later and he was already able to open his mouth wider than before the surgery. “The physiotherapist is really impressed and she works with these joints every day, and she says the range of movement … is a lot more than other patients that she’s worked with,” he said. As for the “Brad Pitt” look, Mr Stratton has been clearly amused by his new chiselled jawline. “People have have been really politely saying that it’s a huge improvement,” he laughed.